Ever since I ran into that article in the Newspaper Archive about the 16,000 pounds of explosives being set off north of San Gregorio to aid in the creation of the Ocean Shore Railroad’s route, I’ve been thinking more and more about the railroad’s proposed route. I haven’t yet tried to find the 65,000 cubic yard displacement that the mighty blast caused, but I did run into an interesting document that is related: It concerns the railroad’s projected route, at least at some point in time, across Pescadero Creek. as well as the knowledge that Highway 1 now follows much of the railroad’s planned route, I assumed the Ocean Shore would have taken a straight shot down the hill, across the dunes, and over the creek bed to the solidity of the promontory to the south. 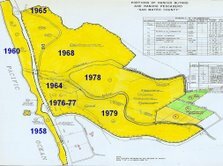 My theory was bolstered by examining the 1972 photos on the California Coastal Records Project website (CCRP). They show the dune-covered peninsula “the gunbarrel-straight route” would have followed, significantly wider even as recent as then, thanks to the much more generous amount of sand that existed to the west. Straight as a rail is almost always best in the transportation business world. routes of railroad-building dreamers were very flexible even before they met the realities of construction. But, based on the aforementioned 1960’s document, it would seem the railroad’s late 19th/early 20th century planners tried to avoid as much of the sandy stretch as possible by bowing to the east, following the lower contour of the hill and then a promontory jutting out from it, until returning to the dune area, where a raised trestle started and continued until it had crossed the creek. I’m guessing with well-driven pilings, the problem of blowing sand drifting on the rail-bed, as well as flooding from the creek, either during storms or when a sandbar across the creek’s mouth created a large lagoon, all would have been dealt with nicely. the route returns to the dunes, crossing over one short swampy stretch. One of these days I’ll try hiking around “North Pond,” as the area encompassed by the route’s bow is called, to see if there are any signs of the railroad’s rail-bed left, other then the faint ledge, that up to now I had thought was only big enough for a jeep or possibly a long ago stage road. 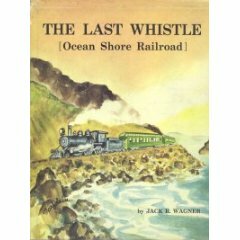 This entry was posted in John Vonderlin, Ocean Shore Railroad and tagged John Vonderlin. Bookmark the permalink.